It’s definitely winter in the nation’s capital – even predicted to snow tomorrow in higher urban areas. 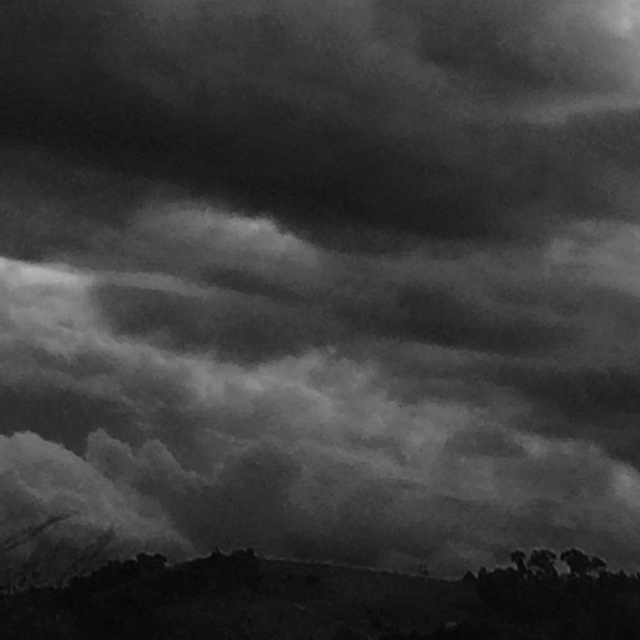 This is a B&W photo of our view from the balcony of our house yesterday. Thankfully when I moved her in 2006 I invested in the right bedding and outerwear to cope. Still it looks bleak and wintery. Just the time for warm winter soups to warm the spirit. In the suburban veggie patch, I am growing broccoli and brussel sprouts this year. Cauliflowers too are cheap ($2 each) and in season, so I found this quick and easy recipe in the latest winter edition of Good magazine (a New Zealand based publication that has piqued my interest of late). I don’t eat onions or garlic, so I substituted my home grown spring onions, some homemade chicken stock from the freezer, a squeeze of lemon from our bountiful lemon tree and I had some left over cream in the fridge. Delicious. In cooking this soup, I timed it carefully. I have a tendency to leave soups on the stove and overcook the beautiful, fresh seasonal ingredients, so this time I followed the timing in the recipe to a tee and it tastes delicious. A sprinkle of parmesan and some crusty homemade bread rolls are just the trick. 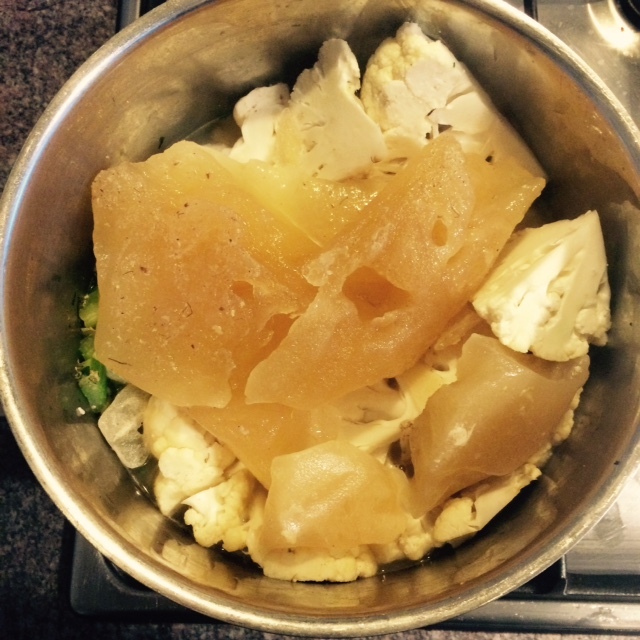 This is a picture of soup once I added my still partially frozen home made chicken stock. In a saucepan on moderate heat gently sauté onion until translucent. Reduce the heat and add garlic, cardamom, chopped cauliflower and lemon juice and cook for about ten minutes until everything is slightly toasted by not browned. When cool, take out cardamom pods and blend until smooth. Before serving, bring to boil and stir in cream. Add salt and pepper to taste. Yummo. The third part of my breaking up with organising series – this is all a work in progress, and I will continue to update as I simplify. Today’s photo series are focused on my study area – and I apologise in advance for the dark before shot. Nonetheless – easy to see it is clutter heaven. 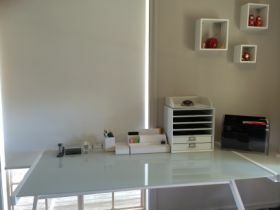 This is where I process our admin and do our scanning/filing – more scanning and less filing these days as I try to cut down on the paper I store. You can see there are some attempts to organise (containers for things, desk top filing units) but it wasn’t a picture of simplicity. 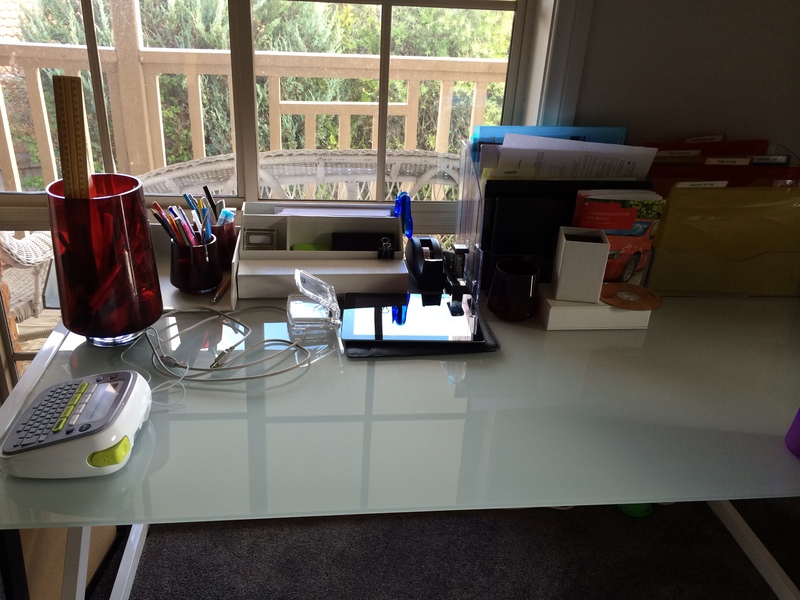 And here is my after attempt – less stuff, less to organise and more peaceful. Organising – you and me are breaking up. 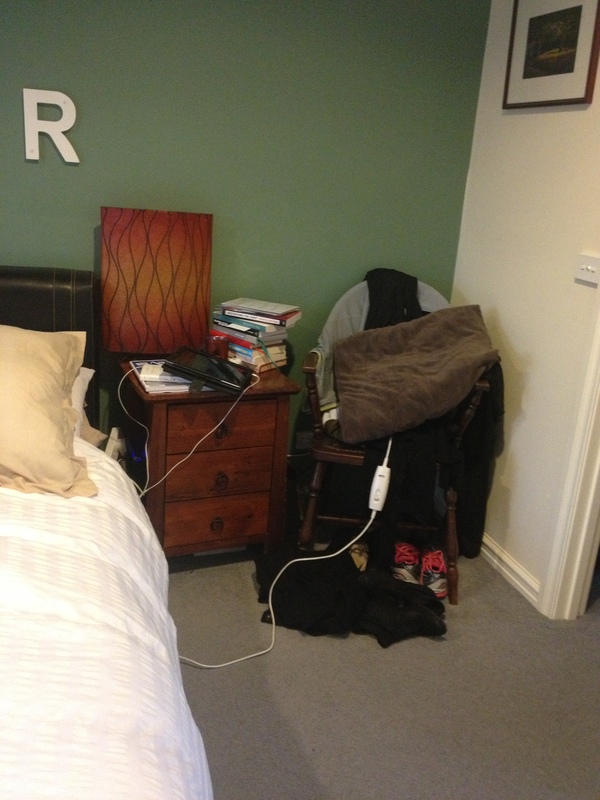 I’ve always been a relatively tidy person. My mum was a little OCD on the cleaning and tidying front. Kids often rebel or subscribe (with some modifications) to their parents way of living, and I went down the latter path. 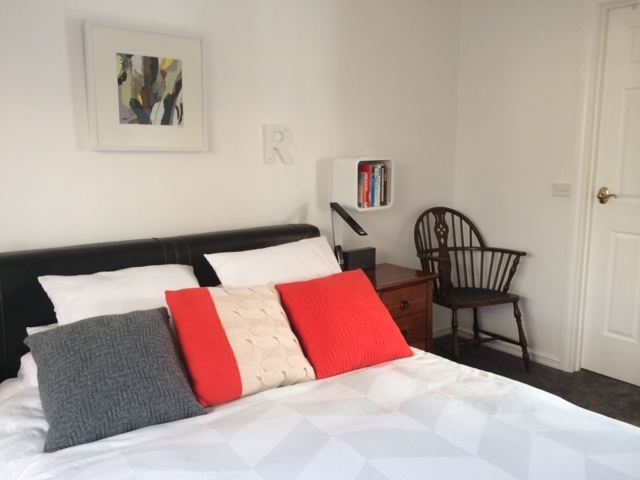 I’m nowhere near as tidy or clean, but I like order – my brain hurts when the house is disorganised. 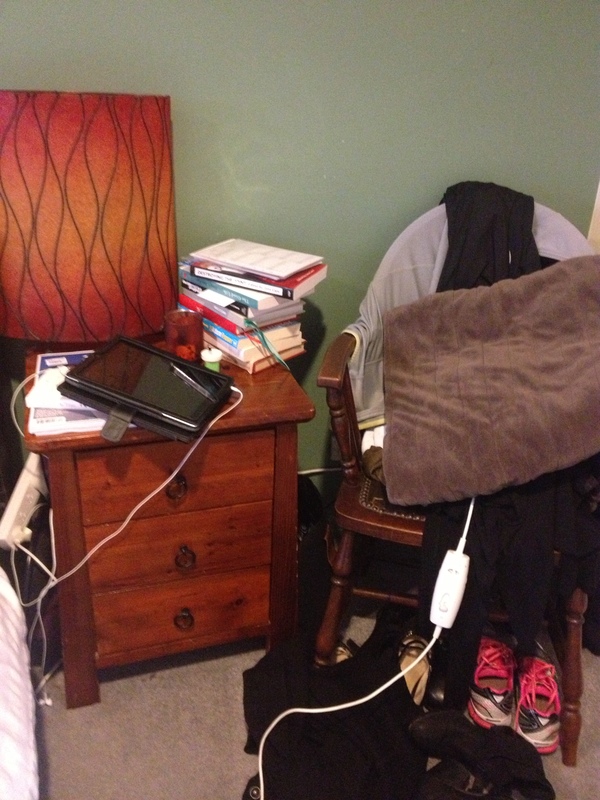 When my husband and I moved in together (we are a blended family) we had two households of stuff. Three kettles. Two sandwich toasters. Three fridge/freezers. Four televisions. You get the picture. Over time, we have been reducing the volume of repeat items and just generally things in the household. I had a small operation a couple of years ago and while I was recuperating and mindlessly googling for organising ideas, I came across the goddess of organising, Alejandra Costello, who is based in Virginia in the US. Her site is www.alejandra.tv and her videos are absolutely fantastic, if you haven’t seen them before and you are early in your journey towards a simpler life. Organising is great first step. Everything has a home and everything (should be) in its home. But I found I wanted more. I was organised but still super busy. I was organised – every cable was corralled and labelled; every cupboard looked sorted and gorgeous – but I still felt overwhelmed by my stuff. I found a few websites on minimalism and I liked 75% of what I was reading. Your stuff should not own you, and book out valuable chunks of your time to maintain it. So – a few months ago, while I was urgently google-searching again for my next movement away from consumerism, I came across Brooke McAlary at www.slowyourhome.com . Firstly – so great to see an Australian movement achieving a ground swell. Simple, slow living can be achieved through planning (in the first stages), establishing gentler routines, and by prioritising experiences over things. A few ebooks by www.theminimalists.com later and a read of a few blog posts from www.zenhabits.com,I have worked out what I need. I don’t need organised stuff – I just need less stuff to organise. So I move on to my next part of the journey to a slower life. Less stuff to organise. The above is a classic move from organising and decluttering, to simplifying. I realise many people before me have been down this road before. Goodbye to organising products = hello to less things to organise. Over the next couple of weeks I will post a series of photo-based posts to illustrate the difference. 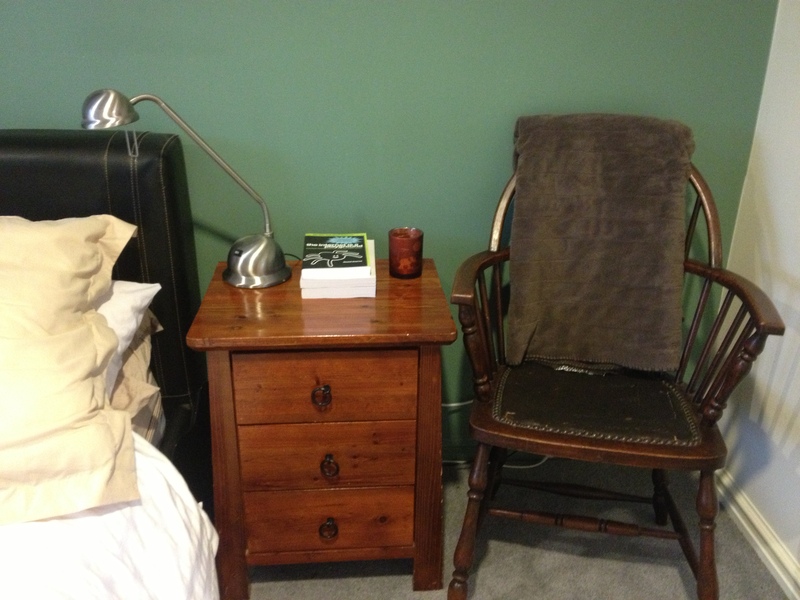 And finally, after a real look at my room – what colours calm me, what simplicity could offer and what I actually needed to use beside my bed – in 2014 (ahhh – peaceful… to me).